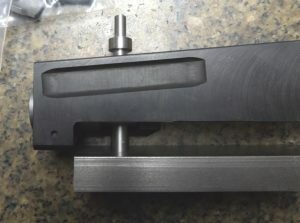 The GS-0015 is a bucking block used to buck the rivets used to fasten the pistol grip nut found on Russian, Bulgarian, and Polish Type 3 milled receivers, as well as Zastava stamped and milled receivers. This part is manufactured from AISI 1018 cold-drawn steel that is not heat-treated. It holds all three (03) rivets securely in order to form the heads on the inside of the receiver and is supplied with a diameter M6 x 0,8 x 30,0mm socket-head cap screw to hold the assembly securely as the rivets are headed. 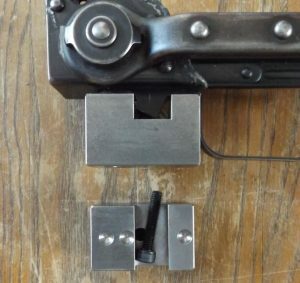 Note – it can also be used to hold a receiver section when drilling the heads from old rivets. The screw is not tightened more than enough to remove the play and is there to stabilize the assembly while in use. In practice it is best to head the front (trigger guard) rivet, the rear (buttstock) rivet, and finally the central rivet. 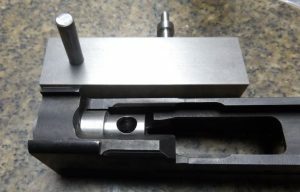 The GS-0038 is a bucking toolset used to buck the single rivet used to secure the turning (bullet) guide of the breech block (aka trunnion) or the breech area of the milled receiver. 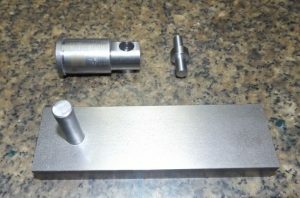 It consists of a shaft that enters the diameter 23,0mm bore, a bucking pin that slides through the shaft, a base that is machined to be 34,0mm wide, and a heading punch that is designed to work with the press ram adapters I sell as well as those sold by others. The loaded parts – the bucking pin and the heading punch – are hardened tool steel for long life. It is very simple to set up and use and works for blocks as well as milled receivers.